I was not surprised to find out the author composed this novel in a tent on the front lines of World War I. The novel is a gruesome, starkly honest portrayal of the horrors of war. The author, however, draws the readers in at first with a light and satirical description of its gentle, naïve and optimistic main characters, William and Griselda. When the story begins, William is twenty-six years old and still lives with his mother. He has an extremely ordered and monotonous life working at a clerk’s office and handing over most of his weekly paycheck to his mother. He doesn’t seem to have any genuine affection for his parent and when she suddenly dies he realizes that he never really loved her. Her death means freedom for him; not only does he now have financial freedom since she left him a sizeable inheritance but he also has the freedom to make his own decisions about the course his life will take. William asks some advice from one of his fellow clerks about what he should do with his time and money and it is through this interaction with Farraday that William becomes involved with political and social reform. William leaves the tedious office where he has worked for many years and embarks on full-time career as a social activist who writes about, protests and goes to meetings about the suffragette movement, pacifism, and other socialist topics. It is at these meetings that William meets Griselda, a feisty suffragette who shares the same ideals as William. The tone in the book that describes these two is one of gentle parody as William and Griselda appear to fight for mostly vague causes. They believe all government is evil and any attempt of a government to raise a military and train it is simply “playing” at warfare. They love to go to meetings and hand out pamphlets and consider themselves strong and tough for fighting against social injustices. They see themselves as the perfect couple and their courtship and devotion to each other is a sweet love story. When William and Griselda take their honeymoon in the remote mountains of the Belgian Ardennes, they are uneasy with the slow-paced, quiet life of the village in which they are staying. But they settle in for a few weeks and enjoy each other’s company. It is on the very last day of their vacation that things take a horrible and tragic turn for the worst. They encounter a regiment of invading German soldiers who treat them brutally and inhumanely. I have to say that the violence in this book shocked me and Hamilton does not gloss over or sugarcoat the atrocities of war. William, the once naïve and optimistic Englishman who lived in his happy little bubble of bliss, now becomes the disillusioned and distraught victim of real warfare. It is not a game or a joke when men are being blown apart and people’s lives are destroyed by gunfire and bombs. I don’t want to give away the plot and the fate of William and Griselda. But I will say that William’s story comes full circle and in the end his life becomes equally as monotonous and numb as it was when we first meet him living under the thumb of his mother. What starts out as an amusing story about two naïve lovebirds becomes a harsh commentary on the gory realities of warfare. I encourage anyone who enjoys World War I historical fiction to pick up this book. Thanks to Persephone Press for reissuing another brilliant book from an important 20th century female author. Cicely Mary Hamilton (born Hammill), was an English author and co-founder of the Women Writers’ Suffrage League. She is best remembered for her plays which often included feminist themes. Hamilton’s World War I novel “William – An Englishman” was reprinted by Persephone Books in 1999. First, I would like to mention that each Persephone book comes with beautiful endpapers and a matching bookmark. Each endpaper and bookmark pattern that are chosen have a history of their own. 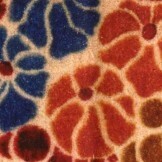 The picture here is the endpaper from The Happy Tree and is a replica of a 1926 printed woolen plush by TF Firth & Sons. This novel shows us the devastating effects that World War I has on ordinary people who are trying to carry on in their daily lives while chaos and death have broken out around them. The story is told from the point of view of Helen Woodruffe, who spends her childhood with her Cousin Delia and her two sons, Guy and Hugo. Helen’s own father has died and Helen’s mother wants nothing to do with raising a child. So Helen’s paternal relations step in and raise her. She spends many happy days running around the family estate at Yearsly with Guy and Hugo. Helen is particularly close to Hugo who is about her same age; they seem to have a special understanding of one another’s sensitive personalities and they share the same interests. As Helen and Hugo develop into teenagers, it is evident that there is a strong attraction between them. Everyone who is close to them assumes that they will eventually marry. But when Hugo takes interest in another girl, Helen agrees to marry a man named Walter because she thinks Hugo is lost to her forever. Walter is a good husband and loves Helen and it is sad that she comes to the conclusion that she has married the wrong person. Helen has three children with Walter and she does seem happy for most of her married life with Walter. The most interesting part of the book is reading about people’s reaction to the war; Helen and her family are at a dinner party when Franz Ferdinand is assassinated and no one believes that there will be a war and any fighting that does break out they believe it will be minor. When Great Britain is pulled into the war and all of Helen’s young friends, including Guy and Hugo, join the fighting no one believes that the war will last for very long. As the war drags on, Helen gets notice of one friend after another who has been wounded or killed in the fighting. In the meantime, she has to deal with food rations, long lines and fuel shortages. This begins to wear her down and she becomes very depressed, especially when her second child is born. This was not life, this daily drudgery, this struggle to keep going, to get through, to exist. I was marking time, we were all marking time, waiting and waiting for the strain to relax, for the war to end; and meantime our youth was going. THE HAPPY TREE is a realistic view of World War I as see through the eyes of Helen and the everyday British citizens whose lives were worn down by this horrible conflict. Persephone Books has given us another great classic that should go on the “must read” list for all those interested in World War I historical fiction. Rosalind Murray (1890-1967) was the daughter of the well-known classical scholar Gilbert Murray and Lady Mary Howard. Brought up in Glasgow and Oxford, she was educated by governesses and at the progressive Priors Field School. 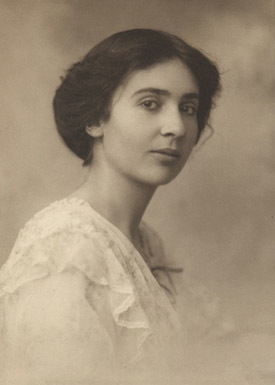 She published her first novel, The Leading Note, in 1910 when she was 20, her second, Moonseed, in 1911 and her third, Unstable Ways, in 1914; this was the year after her marriage to the historian Arnold Toynbee, with whom she had three sons between 1914 and 1922. The Happy Tree came out in 1926; it was followed by another novel, Hard Liberty, and by a children’s history book. During the 1930s Rosalind Murray’s interests turned to theology; although brought up agnostic, she was received into the Roman Catholic Church in 1933, and published several books about faith and religion. She parted from her husband in 1942 and spent the rest of her life farming in Cumberland.